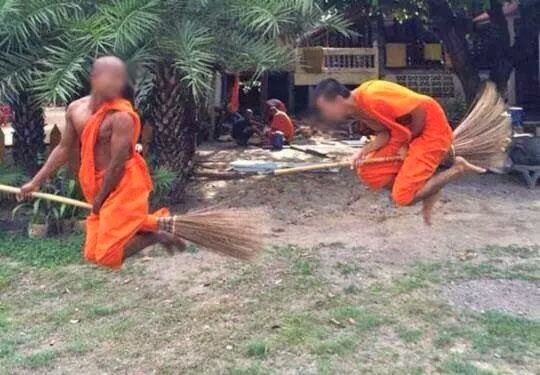 Pictures of two young monks riding on broomsticks at a temple ground have gone viral, with many people viewing their conduct as inappropriate. 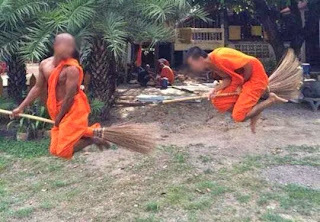 The monks jump around about a metre above the ground while riding a broomstick, mimicking the conventional perception of a Harry Potter flying on a broomstick. They seemed to race on the broomsticks. The monks were probably caught in their antics while cleaning the temple grounds ahead of the Asanha Bucha and Khao Pansa ceremonies on the coming Friday and Saturday. Some people described their capering around as "amazing", but other criticized it as inappropriate behaviour for monks they felt should show a calmer demeanour.